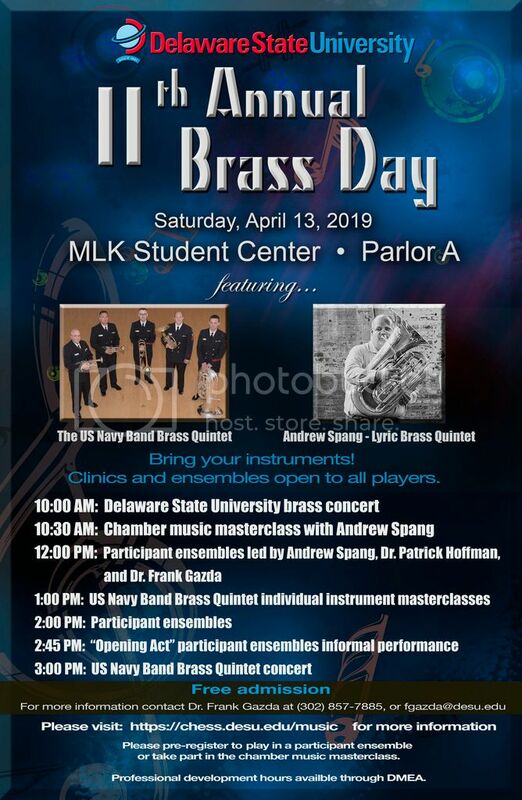 The Delaware State University Music Program is proud to present our 11th annual Brass Day on Saturday, April 13, 2019. Events begin at 10:00 AM, and are free and open to the public. This year there will be participant ensembles that will be directed by Andrew Spang and DSU faculty members Dr. Patrick Hoffman and Dr. Frank Gazda. These ensembles are open to students and players of all levels and will perform prior to the concert by the United States Navy Band Brass Quintet. Please contact Dr. Gazda at fgazda@desu.edu" target="_blank to pre-register and get your music if you plan to play in one of these ensembles. There will also be a chamber music coaching session led by Andrew Spang. If you are a member of a group or have a student ensemble that would like to play on this class, contact Dr. Gazda at fgazda@desu.edu" target="_blank. Join us for a day of concerts, clinics, and masterclasses. Please contact Dr. Frank Gazda at fgazda@desu.edu" target="_blank for more information, and please share the attached flyer with all interested parties. Thank you!